Soluble in DMSO. Slightly soluble (<1mg/ml) in ethanol. 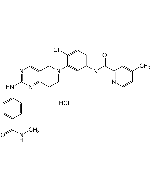 SAR131675 is a potent and selective VEGFR-3 inhibitor. It inhibited VEGFR-3 tyrosine kinase activity and VEGFR-3 autophosphorylation in HEK cells with IC(50) values of 20 and 45nM, respectively. SAR131675 dose dependently inhibited the proliferation of primary human lymphatic cells, induced by the VEGFR-3 ligands VEGFC and VEGFD, with an IC(50) of about 20nM. SAR131675 was found to be highly selective for VEGFR-3 versus 107 receptors, enzymes, ion channels, and 65 kinases. However, it was moderately active on VEGFR-2 with a VEGFR-3/VEGFR-2 ratio of about 10. SAR131675 had no antiproliferative activity on a panel of 30 tumors and primary cells, further showing its high specificity and indicating that SAR131675 is not a cytotoxic or cytostatic agent.